The multipurpose Ranger 4000 is the right tool for industrial weighing applications in which value is important but quality, durability, and functionality cannot be compromised. The multipurpose Ohaus Ranger 4000 compact scale is the right tool for industrial weighing applications in which value is important but quality, durability, and functionality cannot be compromised. 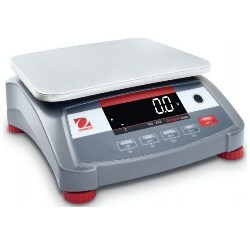 Portable with die-cast metal housing and a rechargeable battery, this scale is equipped with seven application modes that can provide results for many industrial weighing and measurement needs. Say goodbye to being restricted to working only near power outlets! Ranger 4000 is equipped with a rechargeable lead acid battery that can provide power for more than 100 hours! It can also be powered through the easy connect power cord that takes up minimal space and automatically adapts to different power line voltages and frequencies, eliminating disruptions in workflow due to power outages and shortages. Sturdy metal housing and slip-resistant rubber feet provide protection and stability necessary for tough industrial weighing, while extending the product’s usable life. Spend time on your work, not on mastering the technicalities of the scale. SmarText™ software makes scale setup and use very simple.